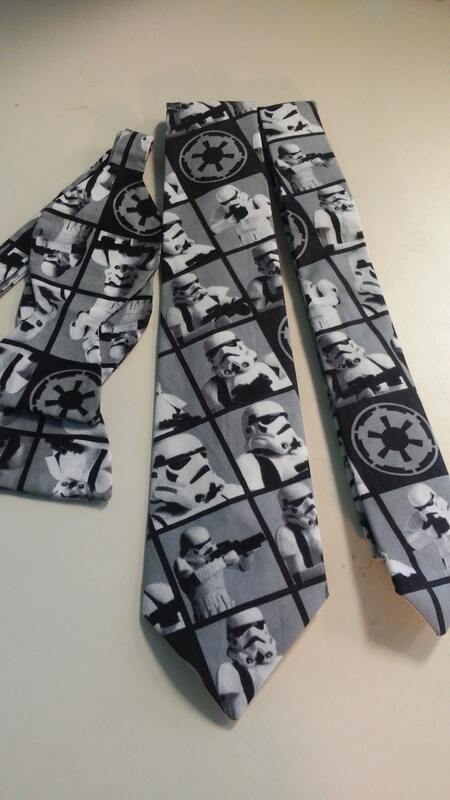 Star Wars Stromtrooper Neckties in adult & kids skinny tie, pocket square, and bow ties Great for any Star Wars fan. Adult bow tie is self-tie, sized to 16.5". Please see chart below for full necktie and bow tie sizing for children and adults. Adult bow tie is self-tie, sized to 16.5"
I bought this for my brother to wear on my wedding day. The only thing I didn't like was that the pieces of the tie would separate when towing it. But other than that, I adore it. My brother loves it as well. (Since it's a different fabric than normal ties, it will tend to do this. But all in all, it's great condition, just needs some starch and ironing. ) Thank you, soo much. I appreciate it. My husband loved it! Great quality tie and I love the design. Was a total hit for X-Mas pictures! Great quality and with a quick press, rivals all commercially produced ties. My son is a huge Star Wars fan and this is the perfect tie for him. He hates having to dress up in a suit and tie and this has made it a little easier.